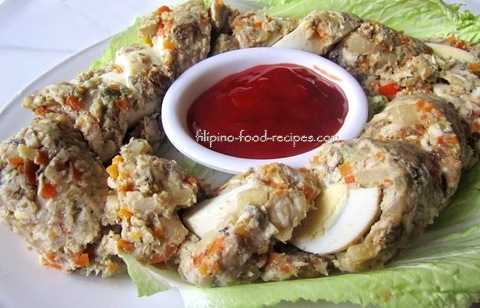 Bangus Embutido is fish counterpart of the iconic Filipino meatloaf -- Embutido. It uses the equally iconic national fish, bangus or milkfish, which is abundant especially in the northern province of Pangasinan. Every year, a Bangus Festival is celebrated in Pangasinan with a cooking competition for bangus as main event. One dish that caught my attention was the Embutidong Bangus -- a cross between Embutido, for the way it was cooked and Rellenong Bangus, for they have almost the same ingredients. Imagine doing a rellenong bangus filling, minus stuffing it back in its own skin (sounds hideous!) -- but rather forming into a log and steamed to cook. This dish is certainly much easier way to prepare than the relleno, and it could be healthier, too, because it is steamed rather than fried. 1 Steam or briefly fry the bangus fillet for 1 - 2 minutes to partially cook, then flake to break down the fillet. 2 Fry the potatoes until lightly browned. 3 Saute the garlic and onions, then add the potatoes, carrots, raisins and red bell pepper. 4 Add the flaked bangus and season with salt and pepper. 5 Turn the heat off and set aside to cool down. 6 Once cooled, mix together the sauteed fish and vegetables with pickle relish, eggs and breadcrumbs. 7 Measure 1 cup of the mix, flatten to about 3" x 6" and lay the halved boiled eggs along the length. 8 Form into a log sealing the eggs inside and wrap tightly in aluminum foil. 9 Steam for 15 to 20 minutes. 10 Slice diagonally and serve with ketchup dipping sauce.